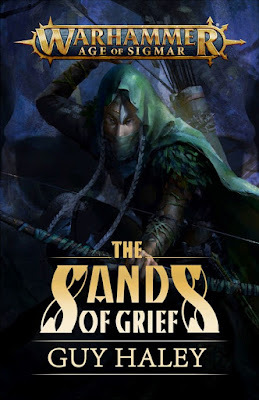 The Sands of Grief is the second installment in what seems to be the start of an ongoing series from Guy Haley focusing on a Wanderer Prince and his spite servant. I love that we're starting to see certain characters get their own series in Age of Sigmar. 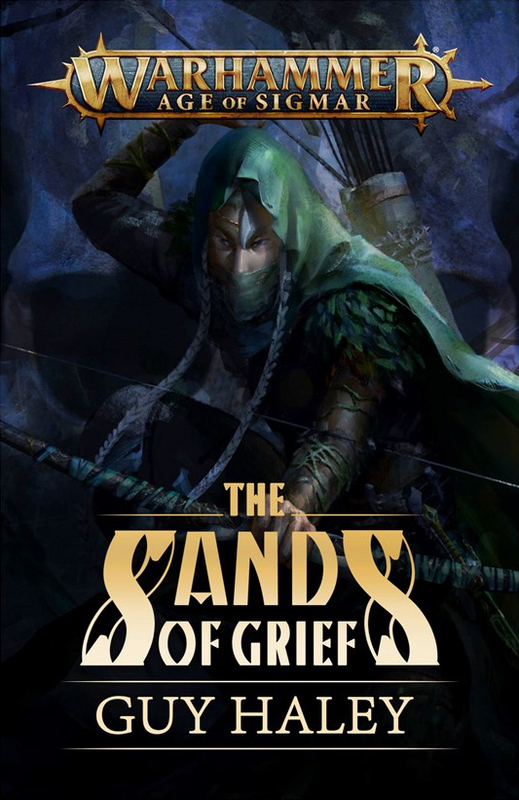 So, what grief do these sands hold? The first installment in this series was The Autumn Prince audio drama set in Shadespire. It was released as part of the Advent Calendar and follows Maesa, an aelven prince who is searching for a way to bring his lost love back from death. It's a really interesting plot device, and not one we often see in the worlds of Warhammer. First off, it's about love, something that's seldom mentioned in Warhammer, and secondly, his lost love is a human women. That, to me, is the most interesting, since she merely died from old age, while he, an aelf, is effectively immortal. His entire life is devoted to her though and he'll do anything to find a way to bring her back. In The Sands of Grief, Maesa has found his way to the city of Glymmsforge in Syish where he is buying some strange, arcance devices from a local shop. This is a fun little scene, since it gives us another look at the day to day ordinary life of AoS. The shop is run by a duardin and a man. The duardin builds the devices, while the man enchants them, since duardin want nothing to do with magic. Once Maesa has secured what he needed, an empty hourglass and a compass, he makes his way through the busy city to where his Great Stag is being housed. The hourglass can keep someone alive forever, as long as you can find all of the grains of Gravesand that corresponds to their life, while the compass helps you find that Gravesand. This is a nice tie in to the events of Malign Portents as well. We get to see a bit more of the city as they prepare to leave, then the prince and his spite make their way out into the deserts surrounding it in search of his lost love's Gravesand. As he traverses the deserts we get a bunch of cool descriptions of Shyish and some more tie ins to Malign Portents that I don't want to ruin here. It all culminates in a fun climax to the story and sets up more adventures, which Guy Haley has assured are coming. Maesa can sometimes come off a bit flat as a character, but I think this has more to do with his aelfish characteristics. They are an aloof race and present that reality when interacting with others. He really does have good depth to him though, which you can see with his obsession with his lost love. The spit, Shattercap, is an interesting character. He's essentially an indentured servant to the prince, so while he's an ally, he's an unreliable ally. I'm excited to see more of these two in the future and hope we get something of a longer length than just these short stories. Even a novella would be welcomed. Maesa and Shattercap are a welcome addition to the growing number of "regular" characters in Black Library's stable of AoS fiction, from Callis and Toll, to Gardus, and the rather extensive cast of Spear of Shadows. I'm excited to see all of these characters grow and become beloved staples the AoS world, just as Gotrek an Felix and others were in the Old World. If you enjoy AoS fiction, especially the more mundane sides of it with the free cities, I would highly recommend this story to you. It's short though, at around 30 pages, which is its only drawback to me.